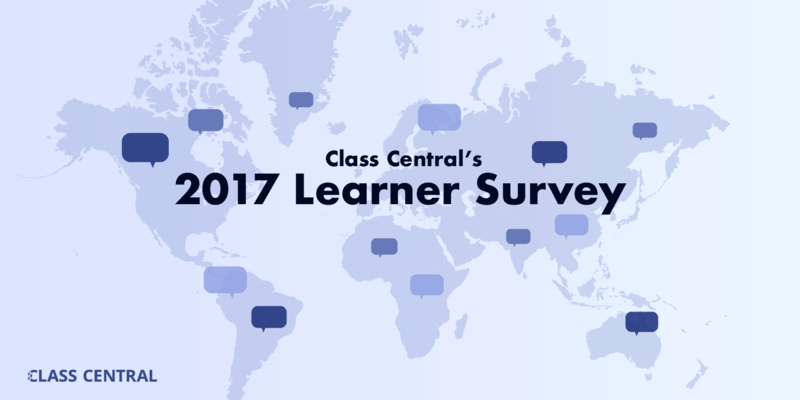 Earlier this year, Class Central conducted the first survey of our users. We wanted to find out more about who you are, why you’re interested in MOOCs, and what value you have found in free courses. We didn’t require our respondents to have registered for, paid for, or completed a MOOC. Our plan is to conduct similar surveys annually so that we can compare the results from year to year. 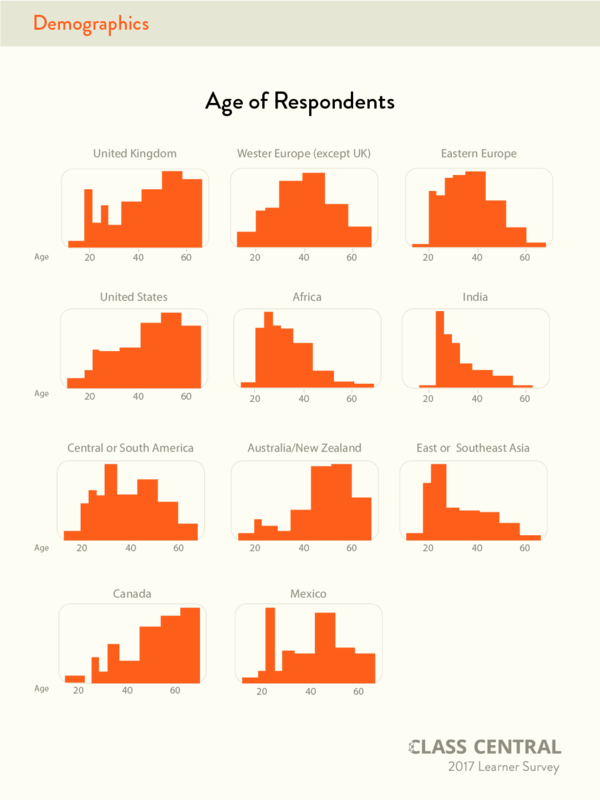 A number of people contributed to this survey: Charlie Chung designed the survey questions and did some preliminary analysis, Laurie Pickard wrote this article, Ronny de Winter dug deeper into the data to generate some of the graphs below, and Scott Robertson made the graphs look visually better. We received nearly 2,500 responses to the survey. 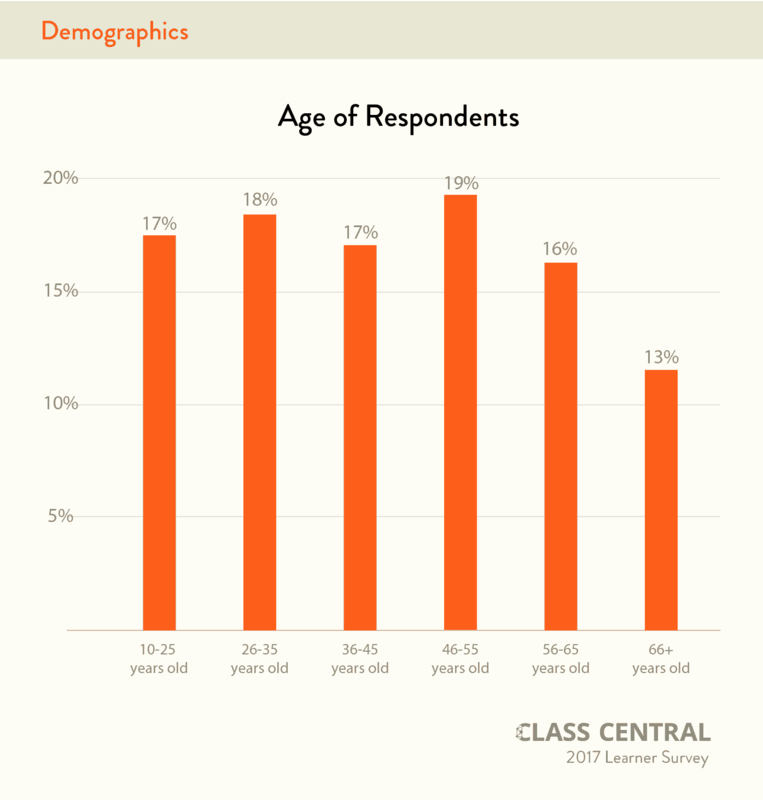 Overall, we found that Class Central users tend to be highly educated. You are interested in MOOCs for both personal and professional reasons, and many of you have experienced career benefit from MOOCs. On the whole, you aren’t keen to pay for MOOCs, and you are divided over the value of the social and interactive elements of MOOCs. More detailed results from the survey are below. About a third of those who responded (32.8%) were from the United States. Western Europe had the second highest amount of respondents. 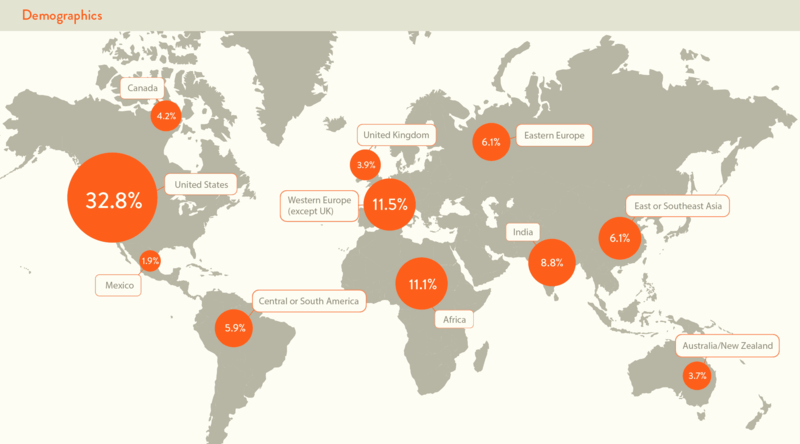 Respondents from the African continent and from India each represented about 11% of survey responses. MOOCs have been popular in India for some time. 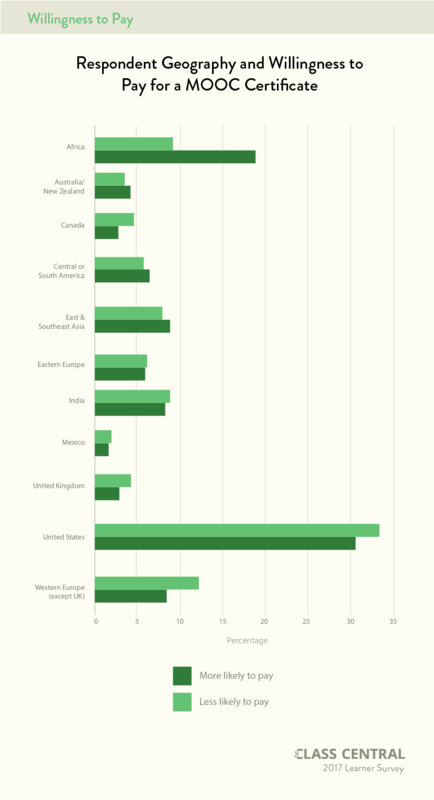 The fact that African respondents contributed so many survey responses shows us that MOOCs may be on the rise in Africa. Our survey had strong, roughly even representation across all ages, from teenagers to middle-aged adults, with slightly fewer respondents older than 65. While all ages are represented about equally, within that there are major differences between regions: visitors from Western countries are on average older, and visitors from developing countries are younger. Our users tend to be highly educated. 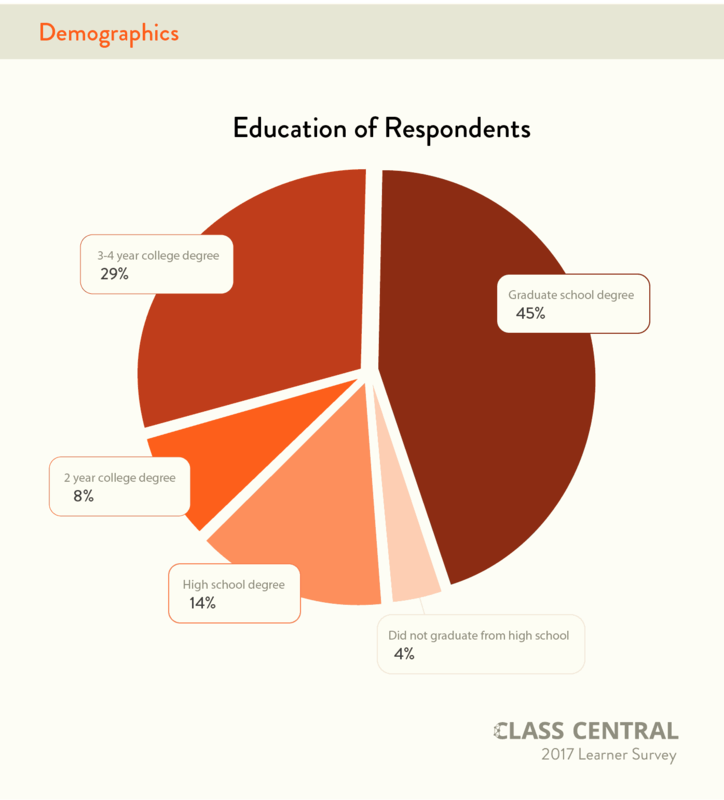 Forty-five percent of survey respondents hold a graduate degree, and well over half have at least a four year degree. 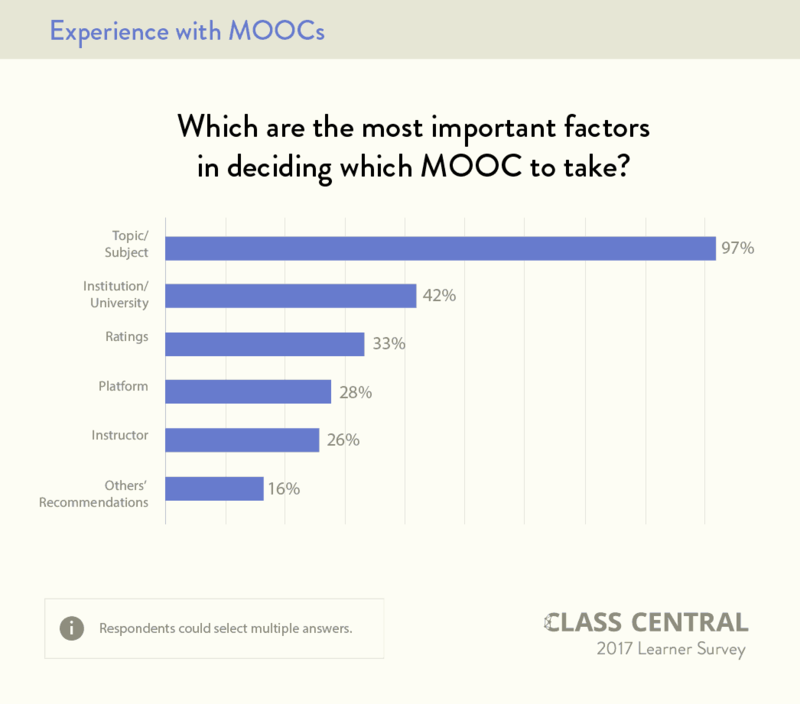 Among our survey respondents, most (71%) had started at least one MOOC. Twenty-one percent described themselves as “Not familiar” with MOOCs. Our users are interested in MOOCs for both personal and professional reasons. The most common reason our survey respondents gave for taking MOOCs was for personal interest (80% of respondents). 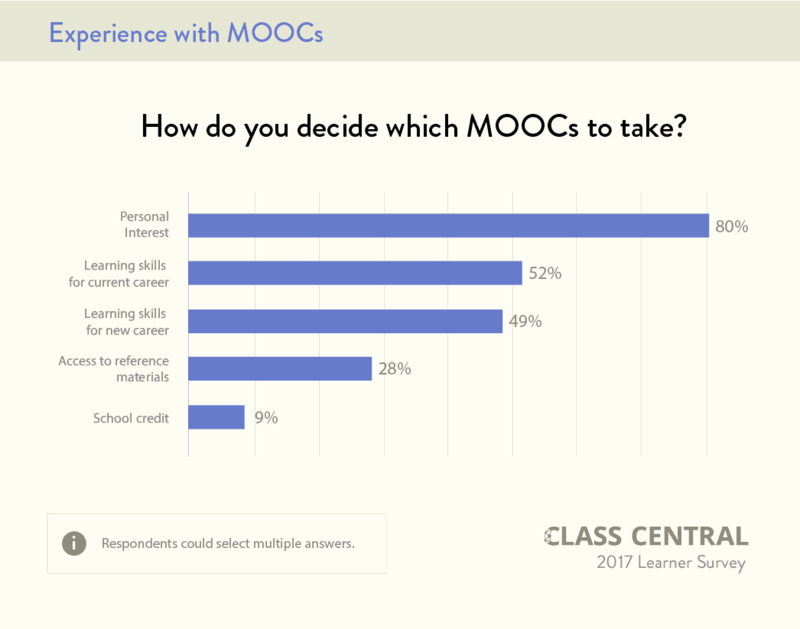 The next most common reasons for taking MOOCs were to learn skills for a current job (52% of respondents) and to prepare for a new career (49%). When deciding which courses to enroll in, our users weigh a variety of factors. Those factors include which university offers the course, how highly rated the course is on Class Central, and which platform offers the course (among other reasons). Although most survey respondents expressed both an interest in and a familiarity with MOOCs, many (57%) were unable to identify tangible benefits of free and low-cost university courses. Among those who did find MOOCs beneficial, the most common benefit users reported was improved performance at a current job (257 respondents). Others said that their MOOC coursework had helped them get a new job (194 respondents) or earn a promotion (58 respondents). Most users did not find benefit in the social and interactive elements of MOOCs. Less than half (48%) of respondents found discussion forums to be an important aspect of MOOCs, and only 25% found active contribution to a discussion forum to be an important aspect. Even fewer thought it was important to connect with other learners taking the same course, either virtually or in person. 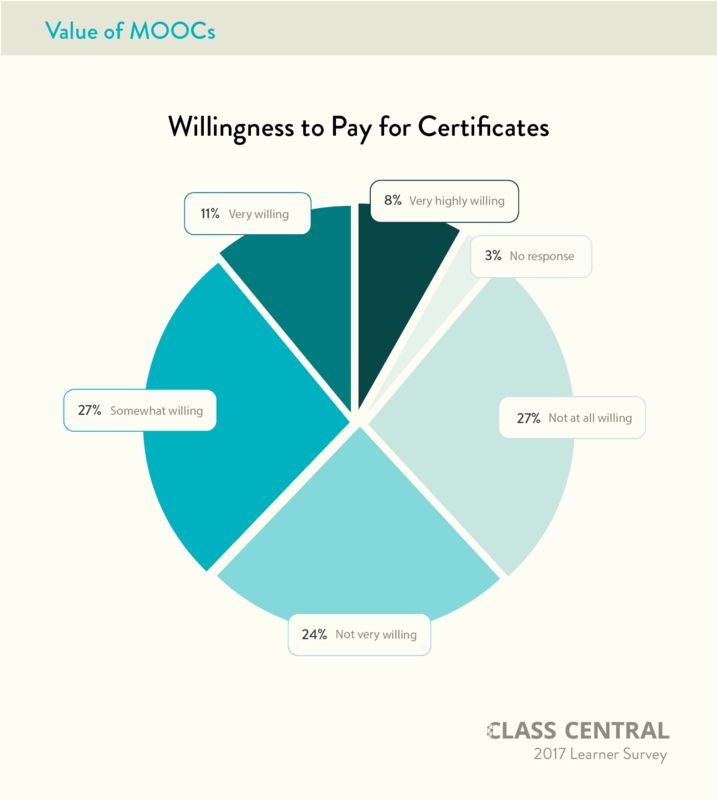 More than half of users (51%) reported that they are not very willing to pay for a MOOC certificate, though close to half of users were at least somewhat willing to pay. 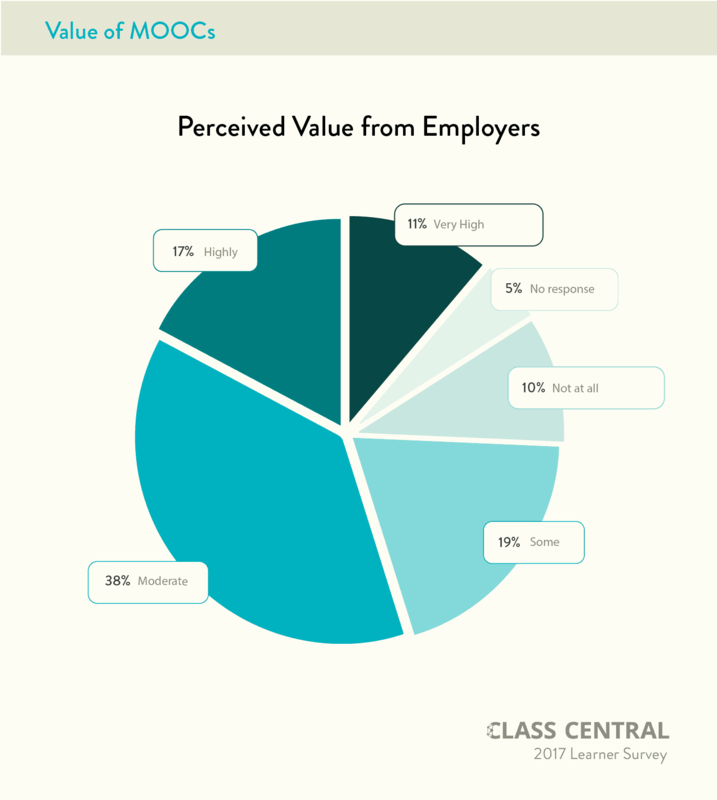 Most respondents (85%) thought that employers find at least some value in MOOC certificates, with 28% believing that employers find MOOC certificates highly or very highly valuable. 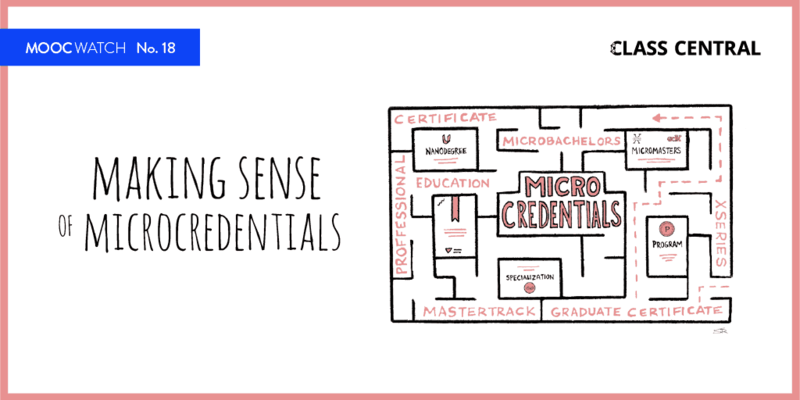 Interestingly, those who had taken fewer courses (or even none at all) were more convinced of the importance of earning a certificate in a course. Among those who were willing to pay for a certificate, 60% said that the course topic had a strong impact on their willingness to pay for a course certificate. Fifty-two percent said that the institution or university offering a course had a strong impact on their willingness to pay. Other factors (the instructor/professor, the course platform, whether the course was part of a multi-course series, and so on) did not have a strong impact on most users’ willingness to pay for certification. Since willingness to pay is such an important factor in the overall sustainability of the MOOC platforms (and their ongoing search for viable business models), we dug in a bit on the data on this topic. Interestingly, we found that Africa is the only region of the world in which there were more respondents willing to pay for a certificate than those not willing to pay. Another interesting finding is that connecting with other students seems to be more important among those willing to pay for a certificate. 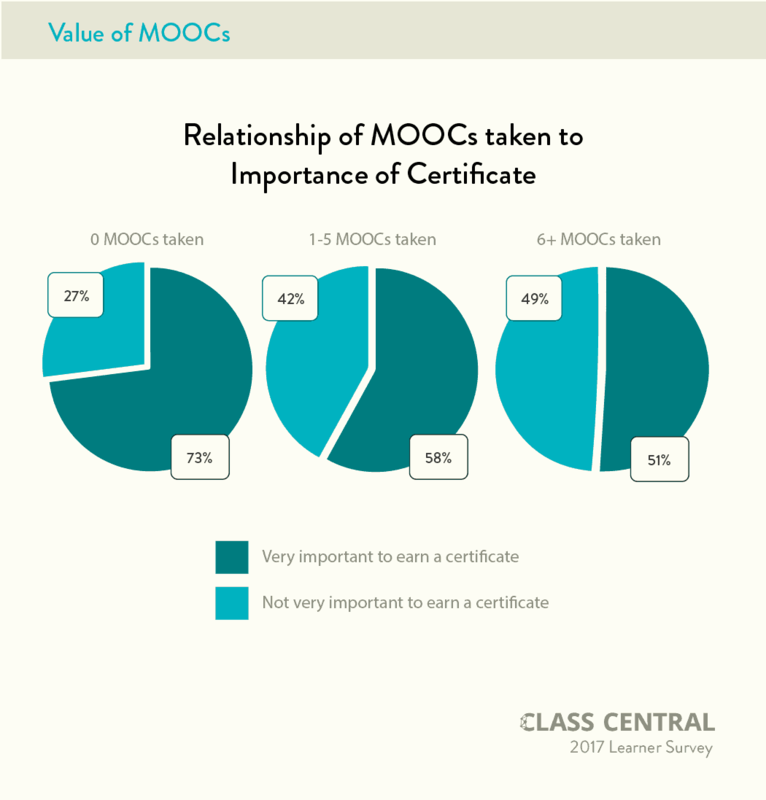 This could indicate an opportunity for platforms to monetize some of the community features of MOOCs, not just certification. 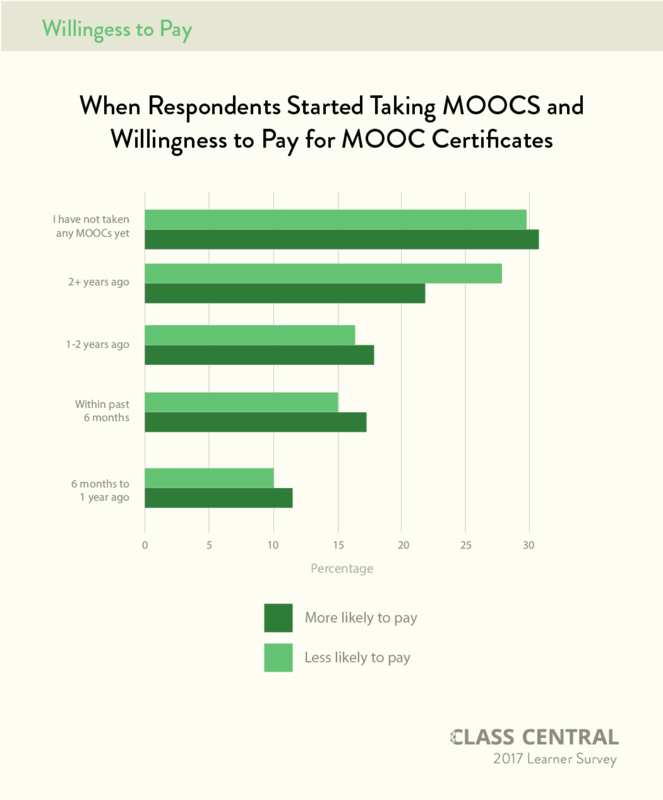 Our survey also revealed that people who were newer to MOOCs were more willing to pay for certificates than more seasoned MOOC-ers. Unsurprisingly, there was significantly more willingness to pay from those in the 36–45 age range. That willingness dropped off in the 56+ age range. I have taken several MOOCS. I think Coursera has a good model. Working with the platform to post and review assignments was frustrating but that is a part of life. I looked at this as a reminder that no one can stop learning. The Coursera classes (both from U Michigan) were a great learning experience. The discussion boards were terrific . Younger students were gracious in helping me problem solve simple pc issues preventing me from Making videos and reviewing other students’ work. I have dropped out of classes with no back and forth in discussion threads. They can be a lot of work and I like the team effort discussion boards can foster. The difference between these experiences leave me less likely to pay for a class. My suggestion is to not only contract with great instructors, but encourage discussion board co-learning. Two good examples for me are Coursera’s Web Design for Everybody Specialization and Their HTML, CSS and JS class within the Ruby on Rails Specialization. I did not take the entire Ruby specialization, just thus class and the Angular JS class. I have found, over time, that Coursera has become more and more aggressive in its attempts to strong-arm students into paying for certificates. These attempts have included making it more and more difficult to find the correct procedure to enroll without paying. For this reason, I have become less and less willing to take courses offered through Coursera and instead, most of my attention is directed to edX which does not use the above methods. I find it rather amusing that, with increasing experience, students are recognizing that the certificates are of little or no value. I also find it both amusing and puzzling that the people who wrote this analysis think that the relatively few students who think the discussion areas are useful would be somehow willing to pay (monetize) for their participation. I would expect that nearly everyone would abandon the discussions entirely. You should not be . They declared in 2012 that they are a commercial company to make money . But how to, they did not know then . Now after being promoted it is right time to make money . If they provide good education I do not mind . But I see their selections of universities are getting worse every day. That means no value of knowledge . I agree with Joschka that the big platforms, particularly Coursera, are becoming more aggressive regarding students paying for certificates. I have, though, paid for 3 Coursera MOOCs, 1 FutureLearn & 1 edX. 2 Coursera ones were for MOOCs I particularly enjoyed & I decided they were worthwhile paying for. The other reason I have paid for courses is for research into the platforms for my blog on MOOCs (www.onlinelearningsuccess.org). I’ve completed 89 MOOCs so far and paying for them all is way outside my budget! Education for profit is greatest sin in the world . Coursera declared in 2012 that they are a commercial company, their intention is to make money , but they do not know yet how to make money . Now after 6 years they found how to make money . Good luck to them, good luck to uneducated people still paying money for them . Poor guys . Why do you thing there are 4.700 HE institutions in the USA . MONEY . 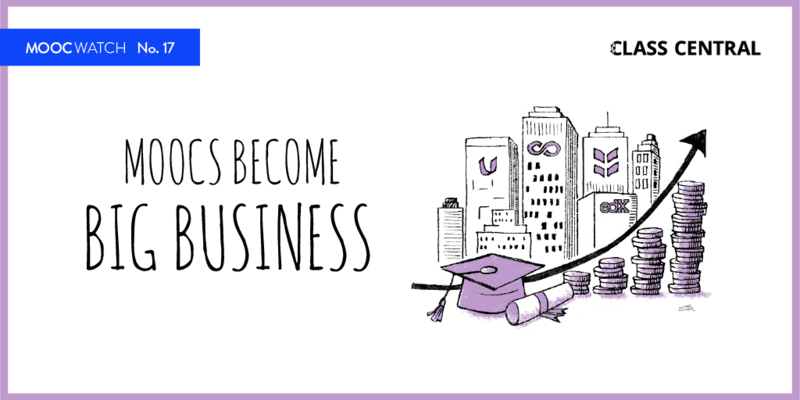 Therefore There are 50 million BA degree holders in the USA. But 25 million that is 50 % of them are underemployed or unemployed . Their salary is same or lower than HS graduates . Reason is obvious . They have been graduated from second class colleges who are making money from ignorant people . You cannot read it . Right. That is 11 TRILLION , 250 billion $ WASTE of money from mostly poor people and parents . Now Every year roughly 1 million BA holders who cannot make living are added from second class schools ..
That is $ 55 billion every year . Waste of money from poor parents, tax payers somehow too . JUST GOING ON NOW . IK cannot believe that the effects of the WWII is still around . That was ended in 1945. Then it was 73 years ago . I am an employer . In order to not lose time and money we look for a degree. But I look for a degree from a first class university. I decdided that first ranked 200 universities can be considered as first class . Even I have fired some MIT graduates, but it is very very rare . Not an ‘effect’ of WW II, but certainly triggered by it. In essence, all of the worker/producers, in aggregate, cannot afford to buy all of their production. Thus, in aggregate, the consumer economy must fail. WW II postponed the failure by add massive government debt (world-wide) to absorb the over production. Keeping people off the labor market is just one of the techniques to extend the life of consumer capitalism. The other is consumer debt (credit cards.) That enables the worker/producers to spend more than they earn and thus to absorb/consume the excess production while maintaining demand. But this too is under threat so the collapse of the consumer economy model is coming ever closer. The consumer economy also fouls the planet with trash and heat-trapping gasses leading to global warming. Two more elements that threaten the current economic models. Given the large, and growing, fraction of students everywhere who ‘go for the piece of paper’ rather than ‘for the learning,’ it is coming to matter less and less which university they come from. Considering how terrible the discussion interfaces and moderator engagement have been in my experience with Coursera and edX, I can’t say I’m surprised at the responses. FutureLearn, on the other hand, does a good job, and it looks like Miriadax may as well (although I take my classes in English, so I don’t have personal experience there). This alone may help explain the mixed reactions. If you are asking students to pay for access to functionality that impacts their ability to learn, it is very important that the pay functionality be well-designed and genuinely helpful to learning. It’s very offputting to pay for quizzes, for example, only to learn that the quizzes have been slapped together with little thought to how they help cement important knowledge. This experience has certainly discouraged me from paying for these in Coursera and edX. Does EDX do the same . Please respond . Very important . edX does the same. No pay, no quizzes! For future surveys it will be interesting to see the percentage of responders taking into account the country/continent/area total population! Shah , I am glad that people realise your value . I offered you many times to guide you for financing . You refused . I hope you can continue to do so . I want to see Class-Central as a ” Regulating Body ” too . 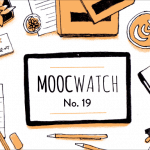 You should , with the help of US News, rank all MOOCs . 1.- Self paced courses are as good as real online .?????? 2.- What is the size of an online class as MOOC and as real course for credit in a quality college . b) You provide access to more than 10.000 courses . c) You will make top schools to provide online degree programs like Georgia Tech at real low price 85 % reduced prices . 4.- I have been using your listings in my online university free . I provide only Master degrees now . 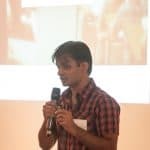 I provide links to 10.000 courses through your class-central listings . I have been indebted to you . I am an engineer. Nothing is free forever. At the beginning I suggested both MIT and Daphne Koller of Coursera to charge a small fee instead of being free . But they had commercial minded . They wanted to make a big promotion being free . May be they were right . From that respect I really appreciate their efforts . My dream is , 200 or so top schools with 5 million enrollment provide online degree programs same as in-person programs from the same professors but at 80-90 % reduced price like Georgia Tech ( They have done it then everybody can do it ) and increase their enrollment by 10 million online students . .